Have you ever tried to cut a mango and ended up making a horrible mess? Mangos, although delicious, can be messy. The trouble is mangos have a hard skin and a large pit inside. Cutting the fruit away from this pit requires a sharp knife and a little bit of know-how. 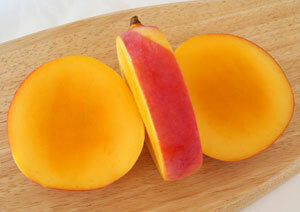 The fruit doesn’t easily pull away from the skin so the only way to remove it is to cut it. 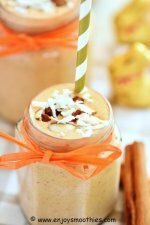 We will show you how to do this with the minimum of fruit loss. After all you want the fruit in your dish, not left on the skin. 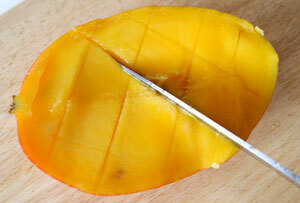 So, follow our step-by-step guide and learn how to cut a mango like the pros. Choose a ripe, but still firm mango. 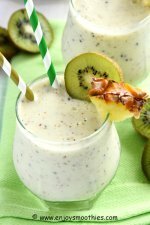 It should have a fragrant, fruity aroma and give slightly when squeezed. 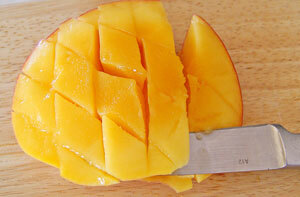 Mangoes that are too ripe are hard to cut, and you will end up with a mushy mess. 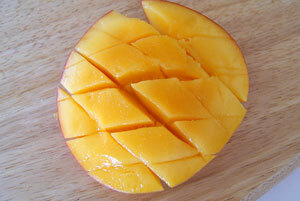 Mangoes have a flat, oblong pit in the center. You need to cut around this. 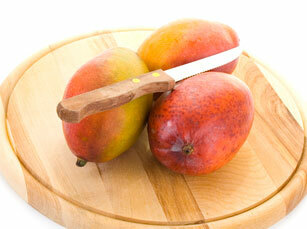 Stand the mango upright, stem side down on your cutting board. Place your knife about an inch from the center. Hold the mango with one hand, then with the other cut from the top of the mango down one side. Turn the mango around and repeat with the other side. You will then end up with two halves or “cheeks” and a middle section which includes the pit. Take one of the halves and use the knife to make shallow cuts crosswise and lengthwise, in a checkerboard pattern, so that you end up with segments. But be careful not to cut all the way through the peel. How far apart you make the cuts depends on the proposed use. For a salad, make the cuts about ½ inch apart. 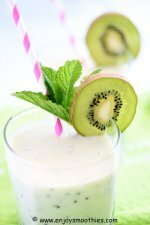 However if the segments are going to pureed or cooked you don’t need to be quite so fussy. Take one of the mango halves, place your fingers underneath the center, then gently push upwards to turn it inside out. 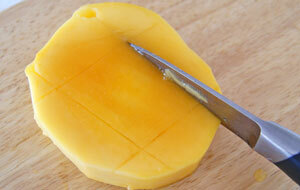 Using a small paring knife, run the knife along the bottom to cut away the pieces from the peel. Take the middle piece with the pit and remove the peel. Then trim around the pit to remove any mango flesh that remains. Remember, you are going to pulverise the mango, so you don’t need it to be as decorative as you would for a salad.